As you know, there are a lot of design patterns applicable in Swift such as MVC, MVP, and MVVM. Depending on the project’s purpose, we choose which one is most appropriate. At iosapptemplates.com, we use a wide variety of Swift design patterns to build our functional mobile app templates. In this article, we’re going to tackle some of the advantages that come with using MVVM Swift and explain clearly with Swift code snippets. MVVM stands for Model – View (View here is View Controller (VC)) – View Model (VM). So what does it mean? It means we are introducing a new component called View Model to help with the heavy workload. Previously, everything including the networking, fetching back the response, handling signals from UI etc, was living inside the View Controller. This made it overloaded. So in MVVM, we will divide the work and delegate responsibility to the view model. View Model: It receives information from VC, handles all this information and sends it back to VC. The convenience when separating work like this. Each component in charge of any particular part will be fully independent of each other. In this article, we will have a login function which handles data inside the View Model. 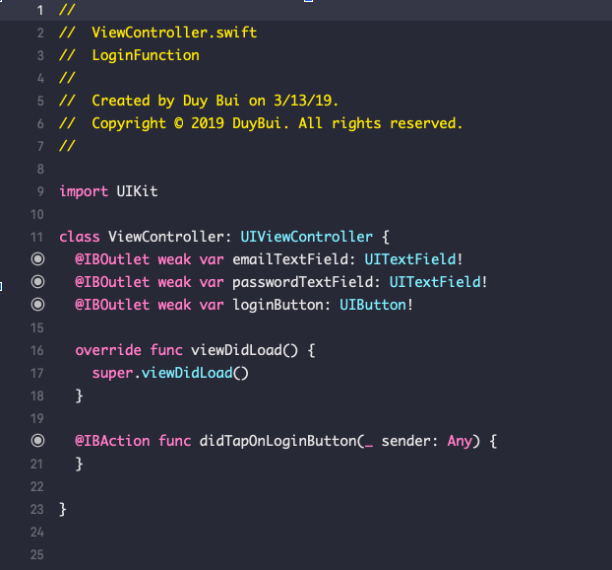 For this comparison, I will ignore the autolayout part and interface builder changes, and solely focus on the connection between VC and VM. Now, let’s get started. Here’s what I got in the starter project. We have all IBOutlets and IBActions – and two important files (VM, VC) of course. 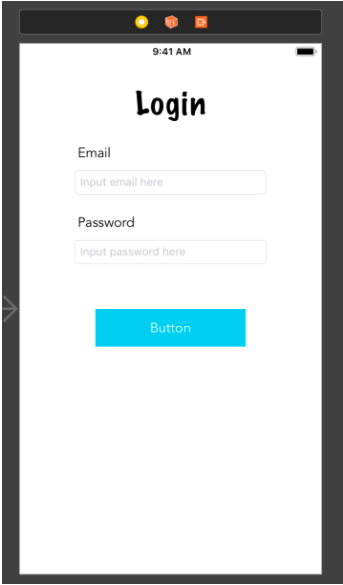 Show and respond to the data from VM: after tapping the Login button, we will see a message which indicates whether the user logged in successfully. It depends on the signal from VM. 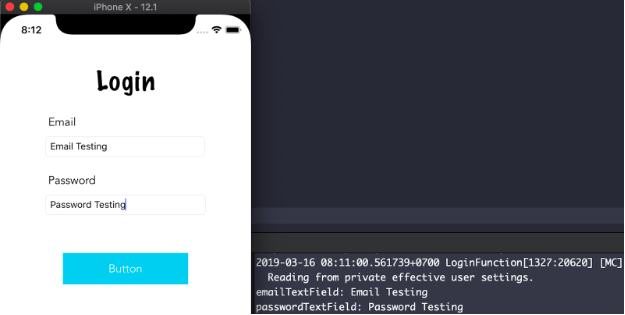 Next, we will create a viewModel variable inside the view controller and here we will send the value of emailTextField and passwordTextField. Alright, it looks cool, right? It looks like we wrapped the information in the package and sent it. The next step, we’ll see where to receive and unwrap this package. Run and fill some values in emailTextField and passwordTextField and see what happens. As you can see, I receive “Email Testing” and “Password Testing” from VC. Let’s first create another protocol called ViewControllerDelegate, and have the view controller conform to it. This means we don’t care what the view model did, we just need the result of that operation. This is a great advantage of MVVM. Whoever is in charge of VC will not care what VM did, they just need the result. Likewise, VM does not need to know where or how VC got values from UI, it only cares what it needs to do with those values. So, all the concerns are separated, keeping all the components independent of each other. For my example, you could see that who’s in charge of coding the view model will care about what it needs to do with emailTextField and passwordTextField, but it doesn’t need to know where these values are coming from. This business belongs to the view layer. Above is the protocol that I mentioned before, and it has a function named getInformationBack. It means we will get values back from VM through this method. Alright, here, we wrapped the final output after handling the value (actually we only concatenated them, but in an actual project, you could do more like validating the email, password and tell VC if it’s available). Let’s now see how we can retrieve the data back into the view controller. In viewDidLoad of VC, we have this line of code: viewModel.delegate = self. Remember that we have a delegate variable in VM, right? This line of code is kind of VC telling VM that it will do the delegation. And then, we just need to conform the protocol and get the value back from VM. Build and run the Xcode project again. We will have all that we need now. We can send the data from VC to VM and vice versa. Let’s wrap up what we have done. In MVVM, we assigned the tasks related to calculate, handle data etc. to VM. We only allow the view layer to do UI chores and get values from UI and user interaction. In this way, each design component is in charge of only one specifically dedicated concerns and they are completely independent of each other. That’s all. I hope after this article, you will have an overview of MVVM Swift and how to implement it using the protocol-delegate design pattern. MVVM is a powerful architecture pattern in Swift and it allows programmers to separate concerns of their design components, so getting a grasp of it is highly essential to any great iOS engineer.